One day your father leaves, and years later he hasn’t returned. You’ve always wanted to be a hunter, and finally you have your chance. You and your friend head off to get your license, and then head off to find some treasure. Along the way, of course, you’ll get tangled up in one thing after another. All enemies are visible onscreen, and enemies move randomly each time you step, most enemies one step for each of your steps although there are a few enemies and circumstances where that’s a bit different, but in general that’s how it works. 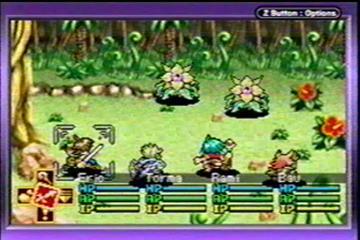 It’s fairly easy to avoid battles if you don’t want to do one, just by trying to walk around or away from the enemy, and there is a spell you can get in the game, which uses no magic points to use, which causes enemies to not move for a number of your steps, which makes avoiding a battle very easy. When you touch an enemy you enter a battle, but how you touch them is important. If you touch them both facing each other’s face, or touching at the side not looking at each other, the battle starts as normal. If, you’re facing the enemy’s side or back, you enter the battle with an extra attack at the beginning, and if the enemy touches you facing your side or back they get the first round of attacks. Battles are your fairly standard turn-based battles, with turns based on Agility rating. There are 5 characters, that you’ll come across during the game, 3 of which are your “main” people and the other two who are just sort of side characters, but, you can only have 4 in your active party at one time. So, if you do have 5 people in your group, you’ll have to choose which one to sit out. In the game, your three “main” characters can use discs to capture most any monster if you desire, and you can then also switch in a monster for one of your characters, as well as have the monster combine with the character to have access to new attacks. Monster catching, however, isn’t required in the game though, so, if it isn’t your thing, don’t feel you’re going to need to do it in order to advance and be powerful, you can just go through the game killing everything you run into and not having to give it any thought. As you battle you’ll gain experience. Even if you have 5 people, meaning one of them isn’t actually in the battle, any character in your party gains experience, with the total experience the monster gives being split evenly between everyone in your party. As you gain experience you’ll advance in levels, which will give you stat increases but won’t actually give you any skills or spells. To get skills and spells, fairly early in the game you’ll run into a “training hall” of sorts, although there are a few other trainers scattered throughout the game, where you can choose to be an apprentice to any of the people in there. Only your 3 main people can choose to be an apprentice, meaning the other 2 characters don’t really have a chance to get spells or skills. You can train your 3 main people any way you want though. Maybe train one to be a healer, one to have strong offensive magic, one to offer some defensive magic, whatever. As you fight and gain experience your level in your apprenticeship goes up, and you’ll gain skills and spells. Once you hit the level of master, however, you can’t advance any further in that area. You’ll have the chance to learn a number of different areas of skills throughout the game, and there are some areas you can’t train in at all until you master another area. There are a number of different environments you’ll explore, from a dry desert to a snowy mountain, everything is created very nicely. There are some little effects, flickering candlelight and rolling fog and such. You’ll sometimes notice a bit of slowdown while running around in towns, but, it’s nothing all that bad. Battles also look very nice, with a large number of different enemies you’ll encounter, battle backgrounds depending on where you are, and some decent spell effects as well. There is also a wide variety of different music for different places, which complement the moods of the areas very well, and draw you into the game. There are also the basic sound effects, such as the swooshing of a sword or the exploding of a spell. Overall, both the graphics and sounds are done very well, and while there isn’t anything graphically that’s going to jump out and shock you, everything looks and sounds very nice. Well, if you’ve never played a Lufia game before, you’re not really missing out on anything storyline-wise. Of course, the downside of that is, if you have played previous Lufia games and are hoping for some deep storyline connections to other ones, you’re going to be disappointed. While there are some connections and ties to previous Lufia games, it’s nothing too dramatic or central, and for people who haven’t played previous ones, most of any storyline connection that you might want to know is explained on books on bookshelves throughout the game. As far as the actual storyline of the game goes, it didn’t feel so much like one over-riding storyline as it did a half dozen smaller storylines. While there is one “main” storyline, which when you complete it the game is over, and while you are made aware of it at the beginning of the game and you do complete it at the end, you really don’t touch directly on it much during the course of the game, so, when you do get into it and complete it at the end, it leaves you feeling a bit empty, as, when you completed all of the other small storylines there was another one following it up, whereas now there isn’t. The problem is, while all of the small storylines did connect to the main one, it wasn’t that strong of a connection, so that along the way it gave one the feeling that one was completing the goals for the main purpose of coming to the end of that particular storyline, not so much for its connection to an overall storyline. That said though, while the storylines did feel a bit unconnected to each other, they all were actually pretty good, so that, while one doesn’t so much have the feeling of achievement at completing the final storyline, one does find a number of interesting plots and problems along the way which are all fairly interesting. My first time through, it took me a bit over 55 hours to complete. It’s a fairly lengthy and challenging game. While one doesn’t really come across with the feeling of “having to wander around leveling up just to be able to proceed past the next point,” and while I only actually died a few times, the battles are certainly far from easy. The first time through, one is pretty much going to complete all of the tasks that there are to complete, there isn’t really any branching story sidequests which aren’t required to beat the game but which one can go back to afterwards. What there is, though, is the Ancient Cave. A long, deep, randomly created dungeon, which isn’t in any way required to beat the game, but is really a challenge to see how far you can go and what you can find. One can find many interesting items down there, and once one has beat the game, it does give one something else to do, trying to finish off the dungeon. One downside is that there’s only one save file, meaning that if you want to start in on a new adventure, you’ll have to get rid of your old game. While you can only actually save at certain areas, anywhere you can do a “temporary save,” which allows you to save and turn off the system and when you come back start at that exact point, but when you load that save it’s erased. So, it’s nice for when you just want to take a break, but if you die or turn off the system without saving, you go back to where your last real save was. Well, the game certainly isn’t perfect, obviously I had some complaints with it, mainly in the area of the storyline. Why a 10/10 for the final rating then? Well, the complaints I did have were relatively minor, and while they all were worth mentioning, the gameplay itself is great, and the game overall is excellent. I would easily say Lufia: The Ruins of Lore is the best GBA game I’ve played, and definitely right up there with any other game regardless of system. Even if you haven’t played previous Lufia games, and even if you’re not too big on RPGs, it would still be worth trying out this game. If you’ve played and liked previous Lufia games, even though there isn’t as much in the way of story connection, it certainly is worth playing this game. 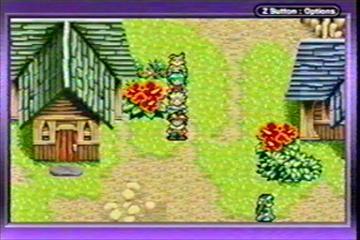 If you own a GBA and like RPGs, you really should give Lufia a try.